Hella rugged, compact trumpet horns with outstanding sound. Galvanized metal body for durability, impact resistant plastic horn. 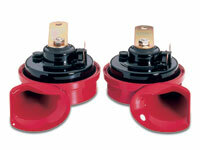 Kit includes horns, relay, and mounting brackets. Voltage 12V Frequency 400Hz low tone 500Hz high tone Sound level 110 dB Dimensions 4-5/16" dia. x 3-7/32" depth.